White gold and black onyx combine to create a look that's almost as beautiful as the starry night sky with these onyx and white gold stud earrings. These genuine 5mm black onyx gemstones from Apples of Gold Jewelry are featured with 14K white gold, and the round cut of the stones adds extra brilliance to an already stunning piece of jewelry. The friction push back closures on these earrings are great for ensuring that your earrings stay securely in place. 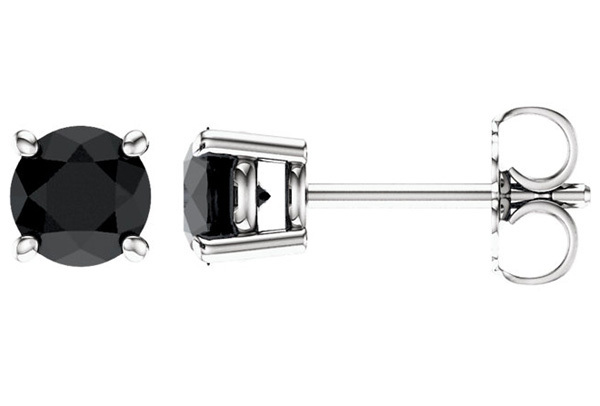 We guarantee our Black Onyx Stud Earrings in 14K White Gold to be high quality, authentic jewelry, as described above.